The cleaning professionals at Sears Maid Services are comprised of local teams that produce outstanding results. With many years of experience in commercial and residential areas, they can provide you with regular services or a one-time deep cleaning; the choice is yours. From the kitchen and the hallway to the dining room and living room, you can trust our expertly trained employees to help clean any mess. Toilets, ovens, microwaves, and ceiling fans are some of the toughest places to clean in a home, but you can count on Sears Maid Services to get those places looking spotless. Give us a call at (585) 342-3810. Many people require a regular cleaning service to come to their home. We understand how important it is that our services work with your busy schedule. Sears Maid Services offers an extremely convenient scheduling system that will tend to all your needs. Whether you're an apartment resident or homeowner, we offer weekly, bi-weekly, and monthly services to cover a broad range of cleaning needs. Sometimes you only need a service that comes around once or twice a year. We can help with those needs with our one-time intensive Deep Cleaning service. With this service, you will receive all the benefits of a regular cleaning, plus extra attention will be given to other areas. A place of business must reflect a positive atmosphere to its staff, clients, and vendors. Dirty office areas promote chaos and disorganization, which can ultimately slow down productivity in the workplace. Having a clean environment can boost morale and increase employees' willingness to motivate others. Count on the professionals at Sears Maid Services to create a clean and well-maintained office for you. Our staff is trained in cleaning techniques to keep your space free of dust, stains, and full wastebaskets. Building a new home is quite a messy job. After fixtures, drywall, and carpets are installed, every room of a new house is going to require significant care and attention. Construction companies typically hire a cleaning service before a home is presented to inspectors, realtors, and prospective buyers. For an outstanding post-construction cleaning, you can rely on the trained professionals at Sears Maid Services. We have expert house cleaning staff at the ready to clean up the mess of a construction crew. 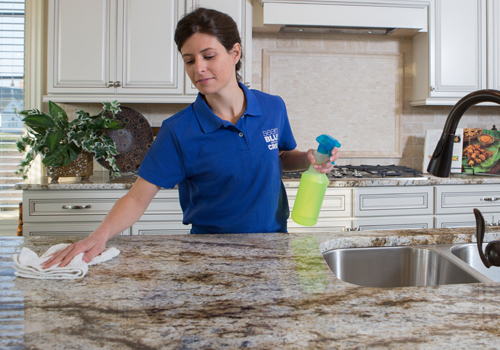 We will wash, sanitize, sweep, mop, and vacuum every possible surface until it is free of dust and debris. We know the importance of trust when it comes to letting service workers into your home. Our level of expertise and integrity is key in helping our business thrive. We aim to deliver superior service in all jobs we perform, but building respectable and honest relationships with our customers and employees is also very important to us. Any prospective employees that come our way are thoroughly vetted with a rigorous screening process and background checks. We work hard to ensure that we reduce any risk of professional wrongdoing. Once hired, new employees undergo thorough on and off-site training to ensure they develop the knowledge and skills required to succeed. We are so confident in the quality of our abilities that we can guarantee fantastic results. If you're not satisfied with the work we've done, inform us of the problem within twenty-four hours of our last visit and we'll send an associate to inspect our work. If we missed anything, we'll come back and fix it. It's that simple. Want a FREE quote by phone?